Nunavut’s candidates? Whatever they’re doing, they’re not campaigning. The federal election campaign began more than four weeks ago, on Aug. 2. But in Nunavut, you wouldn’t know it. The incumbent candidate, Conservative Leona Aglukkaq, did get her re-election effort off to a quick start and has already toured at least nine communities, including Iqaluit, where her boss, Stephen Harper, helped her campaign get launched. The other candidates? Whatever they’re doing, they’re not campaigning, and they’re doing little to raise issues of vital importance to Nunavut residents. That includes the hapless no-hoper candidate for the Green party who has already conceded he can’t win. But the candidates for the two major opposition parties are also acting as if they don’t want to win. Despite all the pious talk about “issues” that election campaigns tend to generate, these guys have been virtually silent. And if you care about the state of democracy in Nunavut, this is not healthy. Here’s a list of four issues that Nunavut’s election candidates don’t seem to be concerned about. If we had more space, we would list even more. After failing to create a virtual monopoly by merging with each other, the two biggest airlines serving Nunavut, First Air and Canadian North, together with Calm Air, have found an easier way to inflict punishment on Nunavut’s fed-up airline customers. It’s called code sharing. Under it, the three airlines act as one. If you buy a ticket on one airline, you could end up flying on a plane owned or leased by another. Same price, same ticket, different airline. Freight works the same way. The airlines have promoted it with the usual public relations gibberish. Greater choice for our customers! Proven and successful! Seamless travel! But you know better. It’s led to skyrocketing fares and plummeting levels of service, including delays and cancellations that put new burdens on the Nunavut government’s medical travel system. There’s also evidence the airlines may be failing to meet food delivery obligations under Nutrition North Canada. It all looks very much like an attempt to create a cartel. That’s an activity that — with some exceptions — is illegal under the federal Competition Act. A cartel is defined as any group of two or more companies who fix prices, reduce the supply of a good or service, or divide up market territories to reduce competition. It’s punishable by big fines that can range into the tens of millions or jail terms of up to 14 years. Are these code sharing agreements illegal under the Competition Act? Or are they covered by exceptions? The Competition Act is a federal law. A federal law enforcement agency called the Competition Bureau is charged with enforcing it. So should the Competition Bureau review or investigate these code sharing arrangements? This is a valid question. But none of the four candidates for federal office in Nunavut have bothered to raise it — or even indicate that they’re even aware of it. 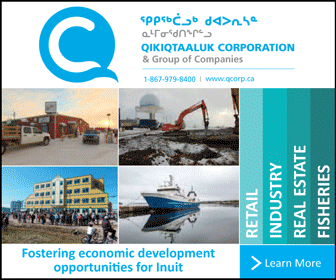 Prior to the federal budget this past April, the Nunavut government asked the federal government for three things: $300 million for more social housing, $200 million to upgrade the Qulliq Energy Corp.’s decrepit fleet of power plants, and a hike — from $400 million to $750 million— in the territorial government’s debt cap. What they got was an increased debt cap of $650 million, but nothing for social housing and nothing for power plant replacements. Did the Government of Nunavut complain? No. Subservient as always, they shuffled their feet and tipped their hat to their masters in Ottawa. That’s their style and it’s not about to change. Aglukkaq has been deflecting attention from this by playing up spending promises on other things, such as the Iqaluit port, broadband connections, training, and tax measures like the UCCB. And what have the three opposition candidates said so far? Not much. Again, they’re acting as if they don’t want to win. You don’t have to look hard to find people in Nunavut willing to complain about the cost of living. Just about everyone finds it unbearable, especially the have-nots living in small, high-cost communities who get by on miniscule median incomes. Nunavut residents of voting age complain incessantly about high costs and high prices, most recently in the context of Nutrition North Canada. But no federal candidates have talked about what should be a major issue for all northern Canadians: the unfinished task of reforming the Northern Residents Tax Deduction. Following a long, loud lobbying campaign, Ottawa increased the travel component of the benefit to a maximum of $6,000 in 2008 — a hike of about 10 per cent. But they didn’t touch the vacation travel portion, which is available only to those who receive a vacation travel benefit from their employer. This effectively discriminates against people, many of them lower income, who work in the private sector and don’t get vacation travel assistance. At the same time, the real value of the benefit is eroded each year by inflation. It’s intended to compensate northerners for their high cost of living — but it’s not actually indexed to the cost of living. So far, Nunavut’s four federal candidates have had nothing to say on this issue. On Oct. 3 2014, Bernard Valcourt, the minister of Aboriginal Affairs and Northern Development, said in Iqaluit that he expected to reach an agreement- in-principle on a Nunavut-Canada devolution agreement. “I think we can honestly say that we expect, all of us, that within a year we can get an agreement-in-principle,” Valcourt declared. Nearly one year has passed since that promise. So what’s up with it?